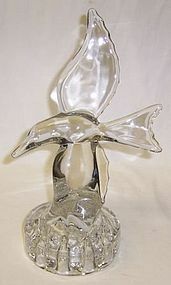 This is a really pretty crystal clear Seagull Flower Frog made by Cambridge Glass in the 1930s to 1940s. This Seagull measures 10 inches tall X 4 1/2 inches across. It is in very good condition with no chips, cracks, cloudiness or scratches. We guarantee all items to be as described. Feel free to email with any questions. THANK YOU. 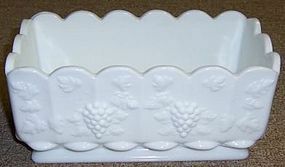 This is a really pretty milk glass 8 1/2 inch X 4 3/4 inch Paneled Grape Window Box Planter made by Westmoreland Glass. This Window Box is in very good condition with no chips or cracks. It is signed WG. Be sure to search our other Westmoreland glass available. We guarantee all items to be as described. Feel free to email with any questions. THANK YOU. 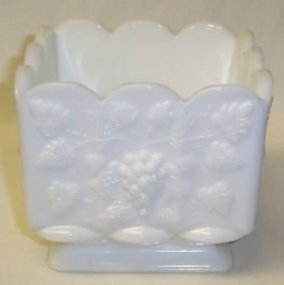 This is a really pretty milk glass 8 1/2 inch X 3 inch Paneled Grape Window Box Planter made by Westmoreland Glass. This Window Box is in very good condition with no chips or cracks. It is signed WG. Be sure to search our other Westmoreland glass available. We guarantee all items to be as described. Feel free to email with any questions. THANK YOU. This is a really pretty milk glass 4 5/8 Inch Square Paneled Grape Planter made by Westmoreland Glass. This Planter measures 4 1/4 Inches high and is in very good condition with no chips or cracks. It is signed WG. Be sure to search our other Westmoreland glass available. We guarantee all items to be as described. Feel free to email with any questions. THANK YOU.